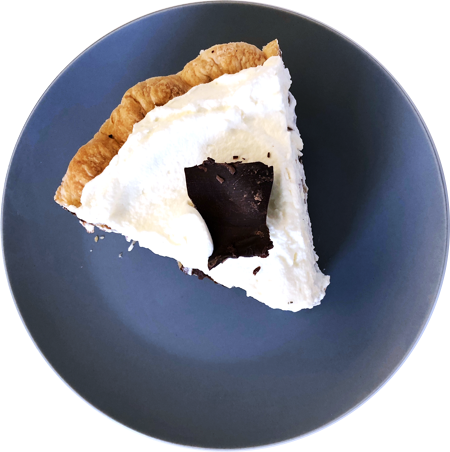 Located in East Village, Hoosier Mama Pie Company is a cute, vintage pie shop ranked one of the best pie shops in all of Chicago by sites such as Trip Advisor, Yelp, and Chicago Eater. The café has a comfortable and homey feel, complete with a quaint retro vibe. The wait staff is patient; they helped us pick the most signature pies made in the bakery, and speedily boxed our orders, even sliding in an extra slice. With twelve pies available for purchase (which rotate daily) the colorful menu can be overwhelming to tackle, so we decided to help by breaking down the options. I enlisted the help of my friend Vann to choose pies, transport them back to school, and keep me from becoming a train wreck. Back at UChicago, Vann, Anya, Aaron, and I sat down with ten plastic forks, seven pies, and four empty stomachs to tackle our pile of pies. At first, the sweetness of this pie is overwhelming. The pie is thick, chalky, and difficult to chew, but in the end, the caramel undermines the sweetness, and it has a good aftertaste. This pie is simple, and there is beauty in its simplicity. As Vann puts it, “Oh f*** yeah”. The apple sour cherry pie is comforting. It is everything one would want in a fruit cake, and received a 9/10 across the board. This pie would be a 10/10 if the crust and top layer had a better crumble, and if the cherries were fresher. The biscuit crust does not work well with the pie, but they are two separate, tasteful additions. Anya also believes that it “visually looks like the morning after ‘halloweekend.’” However, the initial display should not discourage anyone from ordering it. The key lime pie is more sour than most, but the daring amount of lime works. The heavy top layer of cream helps cut the bold filling instead of just adding a mouthful of unnecessary fluff. This pie received third place because it is a reliable standard, but underwhelming in most other regards. The chocolate cream pie is a classic. It’s not great but it’s impossible to think it’s bad, and it’s perfect for picky eaters. The crust crumbles well, and the chocolate-to-whipped cream ratio effectively blends the frothy cream with the thick chocolate. Still, it should be noted that it’s incredibly sweet. As Anya remarks, “This makes me feel like I’m gonna have diabetes.” It’s ambitious to try to finish the entire slice in one sitting. This pumpkin pie is a visually attractive pie with an unexpectedly thick consistency. It has too much pumpkin and tastes like a vegetable stew. A sweet pie ideally needs to be a dessert—not a main course—and this pie is not sweet enough to achieve that status. Not a single one of us wanted to take a second bite. Overall, it is a disappointing pumpkin pie. This is everything wrong with a pie. The initial reaction is to spit it out, as it tastes raw and has the consistency of almond paste. Everyone’s face turned white upon the first bite, and the best word we could think of to describe this pie was “weird.” Vann remarks that he was on a rollercoaster of emotions, with each peak and trough making him yell, “Oh God no, please no.” The sprinkles add a bizarre crunchy texture to the otherwise melt-on-your-tongue paste. We couldn’t finish this pie. Across the board, the pies from Hoosier Mama Pie Company are all incredibly sweet. However, the first four pies on this list and the homey ambiance of the café are worth the effort of driving to East Village and paying an average of $9 a slice. We appreciate the determination and love put into the homemade pies and acknowledge that this is the place to go if you’re craving a mid-day slice of pie.